It took some years after the DVD was released for the first TV shows to appear in this format. Now these are so popular the studios are trawling the early days of TV to find more shows to present, and meanwhile releasing new TV shows almost as soon as they have finished their original airings. 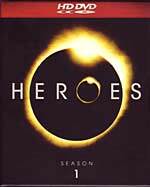 So perhaps I shouldn't have been surprised that a TV show has made it to HD DVD this early, in this case the science fiction thriller/mystery series, 'Heroes'. If you missed it as it was broadcast this year, here you will find all 23 episodes on seven HD DVDs, and so much more. An incredible amount more. This package shows what HD DVD is capable of. First, though, the show. This is a brilliantly constructed piece of nearly 17 hours, covering of a bunch of differing people enjoying, or suffering, the surprising emergence of a range of super hero powers. There is a paper-thin explanation about genetic mutations. If you know anything at all about Darwinian evolution you will stifle your irritation and accept it for the purposes of the show, since it is slightly necessary for the plot. What's impressive is the handling of these differing powers, the generally well handled special effects, and the fact that there are roughly a dozen major characters of whom you are easily able to keep track, as their stories intertwined, join, depart and finally all come together at the end. Some of the super powers are traditional, and some not. But all work well. As do the incredible array of special extras. Most of the episodes feature a video commentary, but with a difference. The commentary window doesn't just overlay the main picture, but the latter shrinks to perhaps three quarters of its size so only a small corner of it is obscured. Then there are 'Character Connections', also available on most episodes, which pop up a colourful biography of the character (again the main picture shrinks to make room). Likewise with 'Artwork'. An important plot element is the predictive power of a heroic artist's paintings. With 'Artwork Presentation' enabled, when these appear the program shrinks a little and two windows appear, with the relevant painting zoomed in one, and a navigation window in the other. Likewise for a particular symbol that appears ubiquitously throughout the show. There is also a 'My Scenes' feature which allows you to mark whatever scenes you like for replaying. But this is fairly useless because it doesn't persist when the player is turned off. Oh, there are the usual collection of deleted scenes, a behind the scenes featurette, some featurettes on the stunts and special effects, and an initially intriguing 'mind reading' game -- intriguing until you work out the trick. Finally, there are also actual 'Web-enabled Features', principally a 'Genetics Abilities Test'. At the time of writing, I still couldn't get this to work with my set up. But it doesn't really matter. Even forgetting about the extras, this pack of seven HD DVDs delivers over a thousand minutes of high quality entertainment, with great picture quality and pretty good Dolby Digital Plus sound. That alone makes it worthwhile. The Blu-ray version of 'Heroes', Season One, is rather different. It is on five discs rather than seven, scores DTS-HD Master Audio 5.1 channel sound (24 bit, 48kHz) rather than Dolby Digital Plus, gets an extra subtitle in Spanish, and uses a different video encode. Same codec (VC1), but the video extracts don't match.